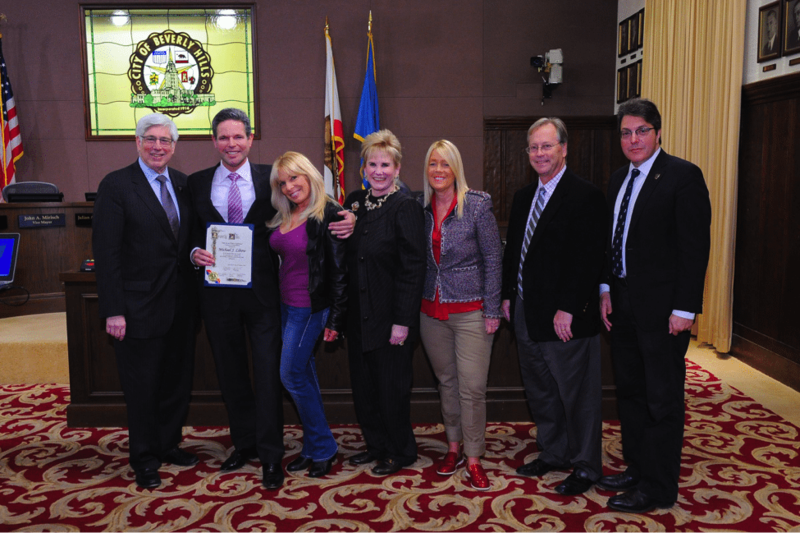 Beverly Hills Mayor Julian Gold recently presented Coldwell Banker Residential Brokerage affiliate REALTOR®, Michael J. Libow, with the Step Up Award, which is presented to those in the community of Beverly Hills who go above and beyond to make a difference in the city. A nearly lifelong Beverly Hills resident, Libow has spent a significant portion of his career giving back to the community, which he says has nurtured him. While on the path toward becoming a Jet Propulsion Laboratories rocket scientist after undergraduate work in mathematics at the University of California, Los Angeles, Libow took a career detour and entered into the real estate world of Beverly Hills. He attributes his passion for real estate to his family moving several times during his youth, which helped him discover that he enjoyed the process of searching for a new home. His career in Beverly Hills real estate began in 1986 and he is annually ranked as one of Coldwell Banker’s top salespeople. Contact Michael at (310) 285-7509 or mjlibow@gmail.com.